As a remaster, Red Faction: Guerrilla is a mixed bag. If you’ve read our review of Red Faction: Guerrilla- Re-Mars-Tered Edition, you know that we weren’t too happy with the game. While the game’s destructibility mechanics are still as good as they were in 2009, we felt the experience suffered from several fundamental issues. 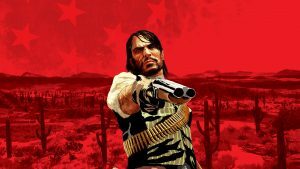 While most of these had to do with the fact that the game’s design philosophies just haven’t aged too well in the nine years that have passed since its original release, another major sticking point for us was the fact that even as a remaster, the new release just isn’t all that successful. Which is a little surprising, because on paper, it actually sounds like a pretty impressive touch up. On the Xbox One X and PS4 Pro, Guerrilla has two modes- one that prioritizes visuals, and another that prioritizes performance. In performance mode, on the Xbox One X, the game is rendered at a resolution of 1800p, and runs at a frame-rate of 60 frames per second, while on the PS4 Pro, the frame-rate remains the same, but the resolution is bumped down a bit to 1500p. 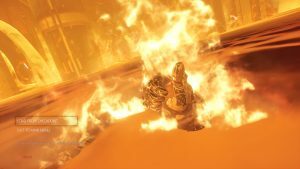 Meanwhile, in visuals mode, both systems boast similar specs for the game, rendering at a 4K resolution and a frame-rate of 30 FPS, which begs the question of why the PS4 Pro had to take a hit in resolution in performance mode (since it can stand toe-to-toe with the Xbox One X in visuals mode). While on paper that sounds great, when you actually see the game in action, it’s much less impressive. For one, no matter what on system or in what mode you’re playing the game, the frame-rate is far from smooth. There are several instances when it stutters, and stutters noticeably. Sure, it’s a game that has a lot of very hectic on-screen moments – the complete destructibility of environments means that there are times when there’s just too much going on on-screen – but the frame-rate drops are quite frequent, and thus a little hard to give a pass to. Re-Mars-Tered Edition also makes improvements to its visuals in other ways. The game has reworked textures, improved lighting, better shadow rendering, post-processing effects, and reworked shaders. The result is, admittedly, quite noticeable. Visuals look much sharper and crisper than they did when Guerrilla first launched, and the level of detail, even when you’re looking at the assets and environments in the game up close, is frankly pretty impressive, especially when you look at it in 4K resolution in visuals mode on both systems. What lets the game’s visuals down, then, is not the technical side of things, which is decent enough, but the very same thing that was also a major issue with the game back when it first released. That is, of course, the game’s bland and monotonous art style. 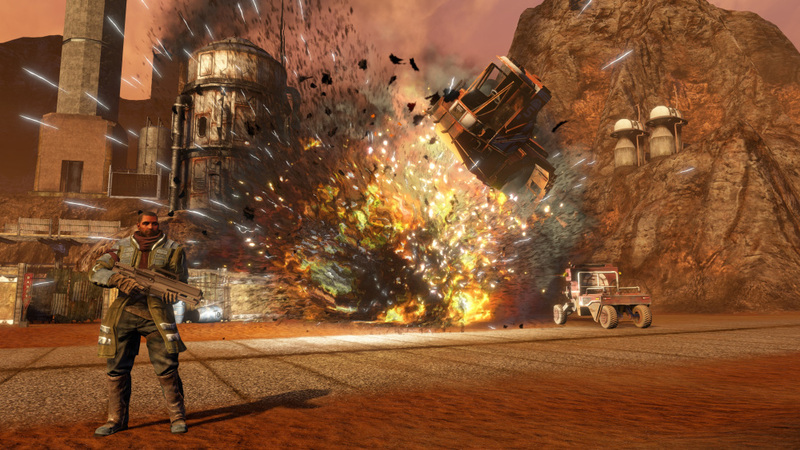 Much like many other games that belong to the Xbox 360/PS3 generation, Red Faction: Guerrilla is almost completely dominated by dull and dreary hues of brown and red. There’s very little visual variety across the entire game, and almost all environments have the same bland, subdued look. Of course, we weren’t expecting the game to completely rework its entire visual palette- after all, this is a remaster, not a remake. 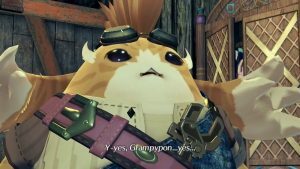 But it’s still an issue, and improved technical aspects can only go so far when the baseline of the game’s art style doesn’t give it much to work with. So where does that leave us, then? As a remaster, Red Faction: Guerrilla isn’t very impressive. The fact that it hits 4K resolution on both the PS4 Pro and the Xbox One X should be lauded, and frankly, visuals do look a lot more detailed thanks to that fact. But the inconsistent frame-rate lets the game down on many occasions, while its unflattering and uninspired art style simply doesn’t do it any favours either. If you’re looking for the next big remaster, you’re going to be disappointed in Guerrilla, but if you’re just looking for a game where you can blow everything you see to hell and back, you might just end up having a decent time.